Swiss luxury watchmaker Saint Honore has unveiled its new Lutécia chronograph watch taking inspiration from the automotive world. The sporty and elegant chronograph features a cushion-shaped case with cleverly structured push-pieces and its large dial opening guaranteeing optimal legibility. In its 42 mm case, the men's Lutécia chronograph strikes the ideal balance between modernity, elegance and technical achievement. The brushed charcoal dial reveals three black counters vertically aligned along the centre and to the left. 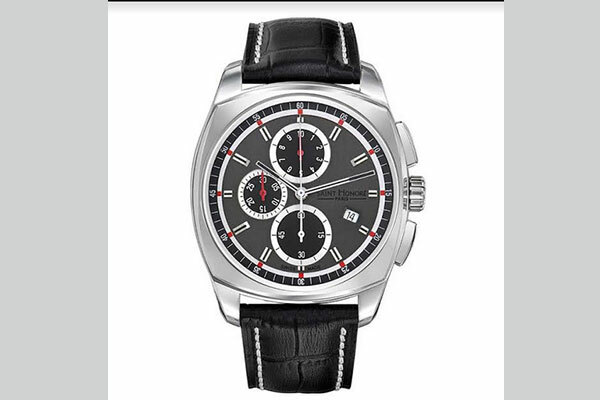 The chronographs respectively measure 60 seconds, 30 minutes and 12 hours.